R4 World Rafting Champs officially opens! The Opening Ceremony was held at the Itaipu Canal, the venue for the majority of the races. All the teams bussed in from the town of Foz do Iguaçu, about a 20 minute ride. Last year’s hosts, New Zealand, and this year’s hosts, Brazil, are building on their friendships that started at the last World Rafting Champs and there was great singing and high spirits in their bus! The teams were seated in front of the stage where a representative from Binational and CBCa welcomed everyone. The IRF President, Joe Willie Jones then declared the 2014 World Rafting Champs open! The teams were then treated to some typical Brazilian dancing and music with some members of the teams being invited up on stage to participate – you can see through their natural rhythm and dance moves that Brazilian’s grow up dancing! The teams were then bussed over to the Iguassu Dam which is an incredible sight for its sheer size once you are standing facing it! This massive dam supplies 75% of Paraguay’s power and 17% of Brazil’s. The size of the turbines is staggering and there are 20 of them! Some interesting reading about the dam. As it was night the dam is illuminated through a special light show and seems to grow out of the dark in majestic form to stand before you as a very imposing, massive cathedral to what man can construct. 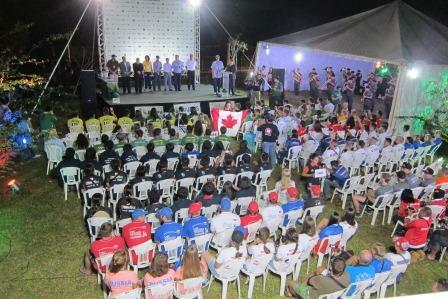 And so the event is officially open, teams have had a chance to dip their paddles in the waters of Brazil and tomorrow they will get a chance to practise on the Downriver river of Iguassu in the morning and Slalom back at the canal in the afternoon. Good luck to all and may the best teams win! Keep an eye on www.internationalrafting.com/live/ for all the latest updates.